theatre of noise: The Wild Swans Catalogue Completed! The second album, Space Flower sees them drifting off-path into a faux bubblegum psychedelia, something Paul Simpson has made a bit of a career out of since, albeit in a more ambient vein. It's all lovely melodies, silly lyrics and phased guitar. Support this site by buying this very generous two-disk set (31 tracks!) from Amazon through the following links. Or, start with those links and buy anything at all from Amazon. Your purchases are at the same discounted rates, but a portion of Amazon's profits instead go to help this site. Thank you. You can visit The Wild Swans, Jem Kelly or Paul Simpson on MySpace. 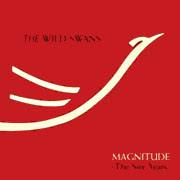 And please don't forget the compilation of earlier Wild Swans material, Incandescent, which contains the massive song "God Forbid" and many other searing testaments to misspent youth. "One day all this will be yours."